15-2133 puts a new spin on remote control technology. If you’ve been shopping around for a new universal remote control, chances are you’re overwhelmed by the amazing variety available. Whatever your style, price range or functional requirements, somewhere out there is exactly what you need – the only problem is finding it. As you’ve undoubtedly seen, the potential for new features and unique cosmetic designs are endless. 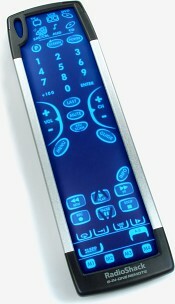 Yet up until now all remote controls have been based on just two fundamental user interface technologies, often used in combination: physical buttons and LCD touchscreens. Of course, there are variations on these themes. Different types of touchscreens are available (such as iconic, graphic and color), and hard buttons are often paired with some form of non-interactive display. Opinions vary on which approach is more intuitive or convenient – many remote owners can speak passionately about why they’d prefer one technology over the other. Hard button fans enjoy the tactile response and freedom from constantly looking at a screen during use, while touchscreen proponents prefer (at a minimum) the ability to fully configure the appearance and arrangement of buttons. Universal Electronics Inc. (UEI) is the company behind the popular One For All and Radio Shack brands, as well as numerous other major lines of controls, and claims to have come up with the next big thing in remote control technology. No, it’s not yet-another voice recognition technology, a fancy PDA integrated solution, or a high-tech plastic block on which to stick all your factory originals. It’s called “Kameleon”, yes with a “K”, and Universal Electronics’ marketing department describes it somewhat dramatically as “digital ink”. Remotes based on the Kameleon design are instantly recognizable – there are no obvious hard buttons and look completely blank when powered down. But once activated the remote becomes an oasis of appealing icons and labels, illuminating dazzlingly from the formerly featureless deep blue void. Sound interesting? Marketing language aside, the Kameleon is a traditional aqua-colored electroluminescent backlight broken up into controllable segments, much like an LCD screen, and then placed over a touch membrane layer that gives the otherwise flat and flexible surface tactile response. The EL segments form the basic outlines of each button, while details such as letters and graphics are formed via a printed overlay (if you look closely a halftone pattern is clearly visible). UEI describes the Kameleon as “intelligently illuminate[ing] only the set of keys needed to control each entertainment device”. Plus, in order to give the first Kameleon remotes a truly contemporary look, UEI has enveloped their product into one of the sleekest-looking casings I’ve yet seen. Sold in Europe under the internationally familiar One For All brand name, UEI has chosen to exclusively market the first North-Americanized Kameleon under the Radio Shack label. Although this limits overall distribution to a single company, Radio Shack has the capability to ensure that it’s readily available nation-wide.